Association of region of residence with human papillomavirus vaccine uptake among 9-17 year old adolescents in the U.S.
Project Abstract: In response to Cervical Cancer-Free America’s Request for National Collaborative Research Project Proposals, we will examine geographic variation in HPV vaccination among 9-17 year old adolescents. Based on 2010 nationally representative data, HPV vaccine uptake was only 29% among 11-17 year old females and almost negligible among similar age group males (2.0%). Studies on correlates of HPV vaccine uptake among adolescent girls identified a myriad of sociodemographic predictors. Geographic region was identified as a significant factor in the variation of vaccine uptake among 18-26 year old adult women. However, a similar variation among adolescents has not been investigated. To address this important gap in the literature, we will conduct secondary analysis using cross-sectional data from the 2008 to 2010 Behavioral Risk Factor Surveillance System from 9 U.S. states. This nationally representative database includes HPV vaccine uptake data and other covariates among 9-17 year old adolescents. Logistic regression models will be used to examine the association between region of residence and adolescents’ uptake and completion of the three-shot HPV vaccination series after adjusting for potential confounders. This study will provide valuable information to federal and state level policy makers and researchers on geographic variation in HPV vaccine uptake among adolescent children. Project Abstract: Hispanics are one of the fastest growing populations in the United States (US) and suffer from many health disparities, including increased rates of human papillomavirus (HPV) infection and HPV-related diseases. 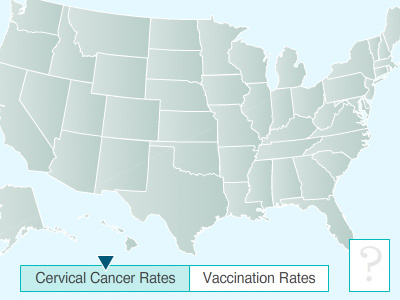 Hispanic females have the highest cervical cancer incidence rate of any racial or ethnic group in the US, and Hispanic males are twice as likely as non-Hispanic white males to be infected with multiple HPV types. Despite this population’s potential to benefit greatly from HPV vaccination, relatively little is known about HPV vaccination among Hispanic adolescents. The proposed project will address this important research gap by conducting secondary data analyses on a national sample of Hispanic adolescents from the National Immunization Survey-Teen (NIS-Teen). The project will determine HPV vaccine coverage among Hispanic adolescent females and males, their parents’ intent to vaccinate, and reasons why their parents do not intend to vaccinate. Importantly, the project will determine if these outcomes differ by parents’ preferred language (a marker of acculturation), an important consideration for the Hispanic population. Results will provide the most comprehensive examination to date on HPV vaccination among Hispanic adolescents in the US and identify targets for future interventions and public health programs to increase vaccination among this population. Project Abstract: With a predicted more than twelve thousand new cases of cervical cancer in the United States in 2013, cervical cancer represents the third most common gynecologic cancer. Gardasil is a quadrivalent vaccine developed to prevent infection with HPV strains 6, 11, 16 and 18, which account for 70% of cervical cancers and 90% of genital warts. Previous studies have demonstrated that, when administered prior to exposure, the vaccine is 98% effective at preventing HPV 16/18 related CIN 2+. Despite its demonstrated efficacy, HPV vaccine initiation among U.S. women remains below fifty percent. This study aims to identify risk factors for HPV vaccine refusal or incompletion among urban women in Philadelphia through standardized questionnaires. Individual interviews will be conducted with a subset of subjects to elucidate common themes for non-use of vaccine, and to determine what acceptable forms of education. We hypothesize that poor vaccine uptake will be associated with lower socioeconomic status, trends in sexual activity and poor understanding of the risks and benefits of the HPV vaccine. By identifying barriers to vaccine acceptance, we aim to design and pilot interventions in the community to target low vaccine uptake populations and measure their effect on vaccine acceptability. Project Description: The DPH HPV Initiatives Team will utilize this grant to support several activities that will lead to the design and implementation of a state-wide strategic plan and policy regarding HPV initiatives. These initiatives will include education, HPV vaccine immunization strategies and any other initiatives identified through the strategic planning process.